1. Package: 1pc Canvas Block Head Mannequin, Rich Free Gifts: 1pc clamp stand table, 1pc Wig Cap, 30 pcs T pins, 6 pcs Clips. 3. Advantage: The mannequin head is Durable Sturdy, Lightweight, Waterproof, and Well made, No mildew smell, No mold, Not wet, No stains, Professional head. Can last a long time with good care. Can make pins to fix the hair and hold wigs easily. 4. Professional Design: The canvas manikin head mannequin is designed according to human head shape and designed with stability and comfort in mind, making your job much easier. 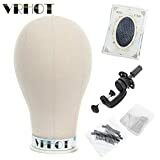 It will be the great choice for hair experts or salon. 5.100% SATISFACTION GUARANTEE: We know you will come to love and enjoy the hair just as much as we do. If you are not completely satisfied with the head , then simply return for your money back. Most popular block head in the market, Purchase with confidence.